Practicing as little as 27-40 minutes of guided meditation daily can produce scientifically measurable effects on the brain’s physiology, reported Harvard researchers in a recently published study. Using MRI imaging as well as psychological scales to monitor changes in levels of depression, anxiety, stress, and worry, these researchers confirmed what Taoist masters have known and practiced for thousands of years—that mindful meditation can create visible as well as invisible change. The Harvard research team observed (in this study and earlier ones) that “gray matter” increased over eight weeks in brain areas correlated with emotional regulation, empathy, and perception. This study also noted that brain cell volume decreased in the amygdala, a region associated with anxiety, stress, and fear. From a holistic perspective, why do these ancient practices work? Being peaceful while using one’s intention can create change on the mind-body-spirit level. You create your own reality—and one of the ways to create it is through harnessing the power of your thoughts to manifest positive change. Even the simple action of taking a break from the chatter-and-clatter of daily life reinforces this intention. These invisible actions, practiced daily, will eventually manifest on a physical level! The proof is in the pudding—these recent studies represent just a few of the hundreds of evidence-based scientific research studies supporting the positive effects of meditation on health issues, including boosted immunity and less risk of heart disease and diabetes. More interested in meditative movement that gets you moving while still producing de-stressing, calming effects? Consider looking into Taiji, Qigong, yoga, or another movement-based energy practice, all of which similarly affect one in mind-body-spirit. If you’d like to try incorporating meditation into your daily routine for better health and peace of mind, experience its effects firsthand with this guided meditation from Master Lu. 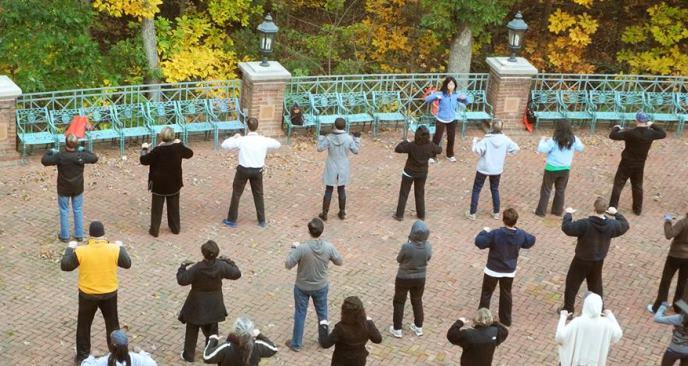 If you’d prefer to participate in a Qigong-based program, consider this one that we teach regularly at TCM World Foundation. Thank you for your enthusiasm!